We are one of the few companies in the United States that manufactures and supplies outdoor recreational equipment. 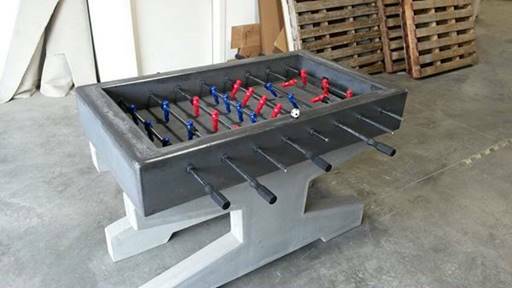 Our latest creation is the concrete foosball table at over 2000 lbs and built to withstand all conditions. Why are we so proud of this table? It’s unlike anything you’ve ever seen before. 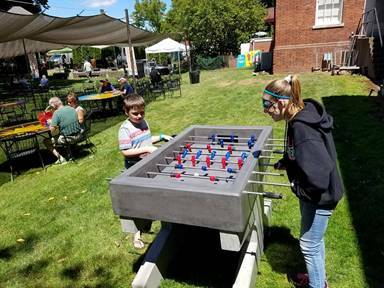 Most outdoor foosball tables look like something similar to an indoor model, just with weatherproof material. 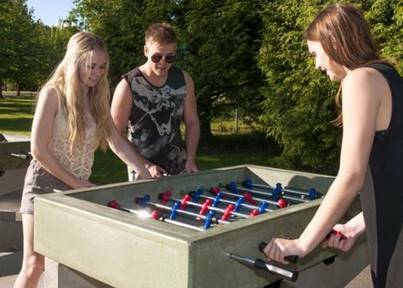 Our outdoor concrete foosball tables will catch your eye (just see the photos below). 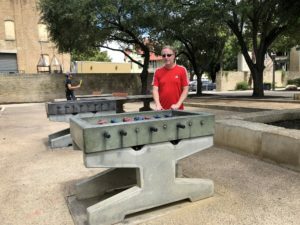 They play just like any other weatherproof foosball table, but made with concrete and steel, they provide a completely different level of stability, durability and long term value. The table sells for $5245 + shipping. 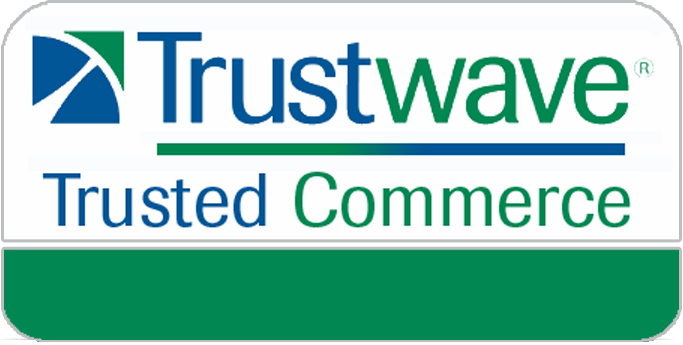 Call us for a quote at 866-926-3839! Frame/Design – The table and legs are pre cast 5000 PSI concrete with steel reinforcement and Novamesh fiber reinforcement. The weight is over 2000 lbs and very stable. The size of the table is 55″ x 32″ x 36″. All bolt connections are done with Zamac (rustproof) cast in place threaded anchors. The legs are done with 5000 psi Concrete reinforced with #4 (1/2”) rebar and 15 lb per yard FORTA FERRO fiber reinforcement. The steel components include steel runners with black powder coating. We use standard size chrome coated hardened steel foosball rods and standard foosball men and handles. Maximum loads – table top 100 psf live load and 420 lb point load. Assembly – With all concrete products that we offer, you want to be prepared for the installation with the proper equipment. Installation takes 1 to 2 hours. The table installs on flat hard surfaces like asphalt or concrete without sub grade construction. We suggest bolting the foosball table to new or existing concrete. Start by bolting together the legs using 2 x 2 powder coated runners. Square legs before tightening the bolts. Level the legs and if necessary permanent shims can be used (1/4″ tiles are perfect). Lifting the concrete tabletop is the hardest part. Using two 12′ lifting straps is recommended – DO NOT attempt to lift the top using the foosball rods. Damage to the table may occur. 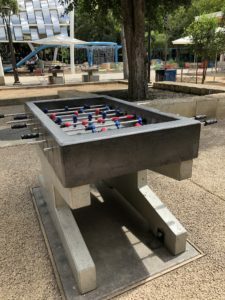 Playability – With standard foosball men and handles, these concrete foosball tables play similar to ones you find in homes. Perhaps you’ve seen one of our tables at a Marriott resort or your apartment community. Rain, snow, etc (outdoor conditions) don’t effect the tables. Once they dry off, they are good to play on again. Minimal maintenance is required to keep this tables in top running condition – which is another reason they are so popular at institutions. Disadvantages – Cost is always something that comes up with these durable tables. Why pay $5000+ for an outdoor foosball table when you can buy a Kettler Carrara table for $1400? We’ve talked with resorts in hot, humid climates down in Florida and other parts of the South where normal outdoor foosball tables don’t hold up. Even the high end tables tend to get rusty rods after a few years and slowly break down. Our concrete tables are designed to last for a decade or more with minimal maintenance. The chrome coated hardened steel foosball rods last – but at a cost. If you are looking for a short term fix, then traditional outdoor tables will work. Long term – nothing lasts better than concrete.